Last week Rosie O’Donnell hosted 9/11 family member Bob McIlvaine and engineer Tony Szamboti on her Sirius XM radio show to discuss the buildingwhat.org campaign. A full description of the discussion can be found here and the show can be heard here. Rosie then introduced two callers – Bob McIlvaine and Tony Szamboti – who are supporters of Buildingwhat.org. Rosie read the purpose of “Building What” and how it’s an effort led by 9/11 family members to reopen the investigation of what happened to Building 7 on September 11th, 2001. She read from the website and said Building 7 fell at free fall speed with no resistance from the support structures as if the support structures had been removed. Rosie read the facts about Building 7 from their website and Pete read the list of the companies that were housed in the building. 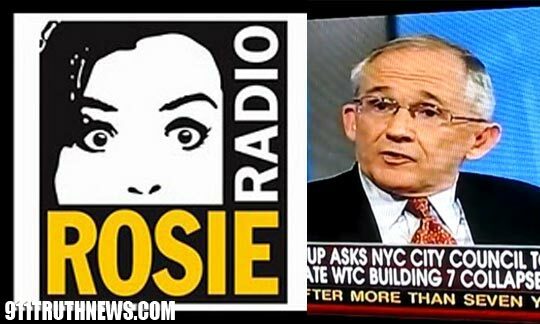 Rosie said Building What isn’t pointing the finger at any one organization or person for the collapse of the building, they’re just saying it defies the laws of physics and too many things have been swept under the table. A new television ad campaign featuring the family members of 9/11 victims has succeeded in garnering what 9/11 activists have lacked for years: serious treatment in the mainstream media. Granted, that media was Fox News host Geraldo Rivera, who in a former iteration ran a Jerry Springer-like daytime talk show. Still, at the end of his serious-yet-brief treatment of questions surrounding the collapse of World Trade Center 7 (WTC 7, pictured), Rivera admitted that the activists had made him “much more open minded” about questions surrounding 9/11. And all it took was the proper message.